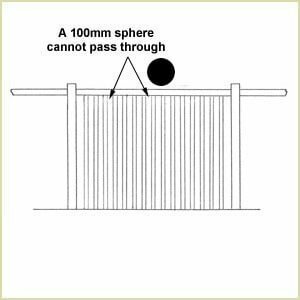 The building regulations state that a 100mm sphere cannot pass through any opening and this includes between spindles. So your maximum space between spindles is 99mm. 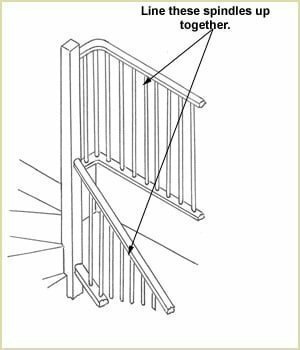 Allow 2 spindles per tread and 1 per tread where there is a newel on a landing. Calculating The Number Of Spindles For A Landing Balustrade. The measurement between newel posts is 1792mm. If you require 32mm spindles divide your measurement between newel posts by 112. e.g. : 1792 ÷ 112 = 16 No. spindles. If you require 35mm spindles divide your measurement between newel posts by 115. e.g. : 1792 ÷ 115 = 15.5 No. spindles. We would recommend rounding up to 16 No. spindles. 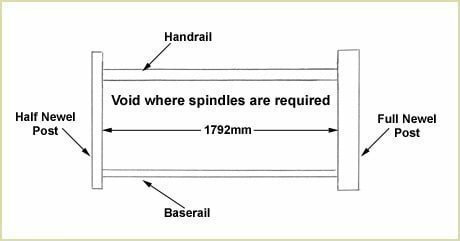 If you require 41mm spindles divide your measurement between newel posts by 121. e.g. : 1792 ÷ 121 = 14.8 No. spindles. We would recommend rounding up to 15 No. spindles. For 32mm spindles divide by 112. For 35mm spindles divide by 115. For 41mm spindles divide by 121. For the balcony landing spindles it may be more pleasing to space the landing spindles so that they are in line with staircase spindles.Pear Stairs sell spindles in all shapes and sizes but remember if you have any questions don't hesitate to phone us about your spindle choice.